KLM Royal Dutch Airlines welcomed a very special group of passengers aboard flight KL696 from Toronto to Amsterdam on Friday, 1 May. 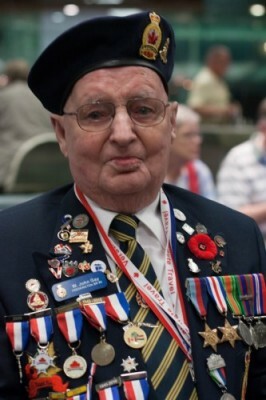 The Canadian veterans of World War II were on their way to attend ceremonies and festivities marking the 70th anniversary of the liberation of the Netherlands. The KLM crew honoured the veterans with an unforgettable flight. There were over forty veterans on board, with an average age of 92. Many of them were accompanied by relatives and there were also three pipe and drum bands on board. The seats aboard the flight had special headrest covers and the passengers were served special meals. Veterans received a White Carnation, Dutch national symbol of appreciation, recognition and respect from and for Dutch veterans. This blog gives an account of the trip and several interviews on board.